So, you've got your login ID and password--now what? 1. Login using the User Login box on the top of the website. 2. You will be taken to a "Member Landing Page". This page has links to your directory listing, as well as the field courses pages, and a full membership directory. This version of the directory contains non-public information, such as contacts for individual members and non-members. From this page you can manage the contact information for your station. Under "My Profile" you'll also find that there are options to upload your logo, print out past receipts, and even manage which email is used for the automated announcements from OBFS here. 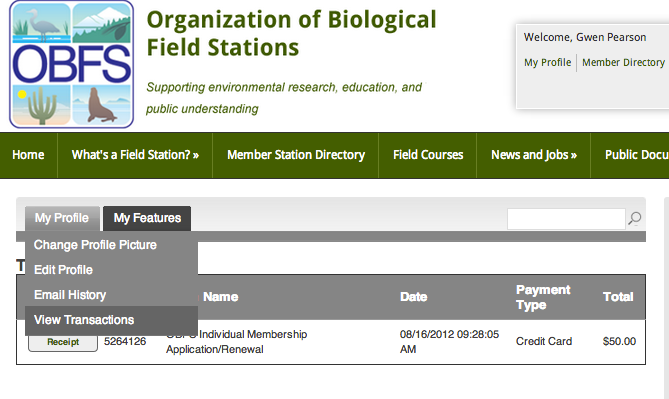 You'll notice some extra fields--"User contact", "User email", etc. in your directory listing. Those are there in case you want to list several people as contact points for your station. If you don't need them, just ignore them! There also is a feature that will let you upload your station's logo. While you *can* upload a huge file, it's going to be scaled to a 65 x 65 pixel thumbnail--so starting with a small, square graphic will give you better results and less distortion. Your station's logo will display next to your directory listing.